änergy training/ teambuilding programs are mindfully engineered such that every individual is set on a platform of success. we take care to ensure that people emerge from our events feeling motivated and good about themselves and others. we understand that every individual is unique and seek to cater to all learning styles and personalities in every of our games. as such, änergy has both indoor and outdoor teambuilding games to satisfy different palates. before änergy training/ teambuilding games are released, they undergo simulation so we can troubleshoot and further improve on the execution. 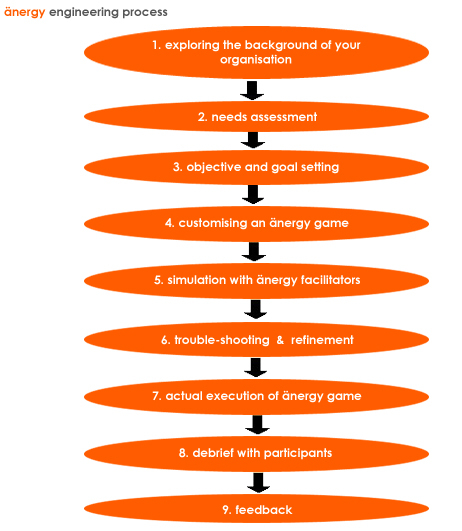 this also helps our facilitators familiarise themselves with the game customised for your organisation. you can be assured that the tried and tested teambuilding games will be thoroughly relished by people of all ages. at änergy, we recommend that time be allocated during our teambuilding session for a fruitful debrief with the participants, so as to further reinforce the intended learning values, and perhaps, spark off action steps for your organisation going forward. whenever possible, participants are also encouraged to share their experiences during the teambuilding session.